With a stay at Raisa Apartments Lerchenfelder Gürtel 30 in Vienna (Josefstadt), you'll be a 4-minute drive from Wiener Stadthalle and 9 minutes from Naschmarkt. This apartment is 1.5 mi (2.4 km) from Hofburg Imperial Palace and 1.9 mi (3.1 km) from Vienna State Opera. Filled with striking Art-Deco style, this 3-star hotel is found within walking distance of Vienna’s historic city centre, and is close to shops and public transport links. On-site you’ll find plenty of relaxing features, including a café-bar, spa and an attractive courtyard. The hotel’s smart rooms include satellite TV, private bathrooms and minibars. 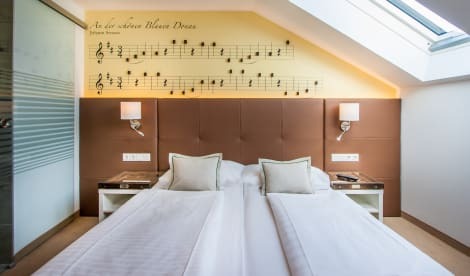 Conveniently located mere minutes from the city centre, this hotel is the ideal base from which to explore Vienna's attractions or enjoy an evening at the famous Vienna State Opera. In the area there are excellent transport links as the tram and metro stop are metres away, so visitors of the hotel have easy access to Josefstadt, a vibrant neighbourhood close to the University of Vienna, as well as Vienna's city hall and other notable sights. The hotel, with its modern interior, endeavours to ensure its guests a comfortable yet affordable stay in one of Europe's most historic cities. With amenities such as a LAN internet connection in all of the rooms, a 24-hour reception and ticket desk, giving you the freedom and independence to enjoy your stay as you wish, the hotel is the perfect choice for those wishing to relax after a day of sightseeing. Urban Stay Hotel Columbia is a family-run guest house set in a historic building, in a central location of Vienna and a 5-minute walk from the Town Hall and the metro stop. Free WiFi is available. The rooms are fitted with cable TV, a safety deposit box and a bathroom with shower. The hotel offers for all guests a big fridge in the public area instead of the minibars in the room, so 2,2 tons of carbon dioxide (CO2) is saved every year for a better environment. A restaurant is in the same building and a supermarket is just 50 metres away. The guests can enjoy coffee and tea at Urban Stay Hotel Columbia all day long for only 1 EUR per drink. The tram and bus stops are just a 1-minute walk away and all the main attractions in the city centre are easily reachable within a 15-minute walk. This lovely hotel is in Vienna. The 438 welcoming accommodation units offer a perfect place to relax at the end of the day. Pets are not permitted on the premises.